Some tips and tricks on how to survive and thrive in the Sub Rosa world. While falling, hold ~ (tilde) to stick out your arms in front of your head, that means if you are falling head down, you wanna hold them up, if you’re falling face first, you gotta stick em out in front of your face. While being stealthy up with a car, gain some speed, switch into reverse and then let go of "w", your car will glide but your engine will not make any noise, allowing you to sneak. (Your tiers will still squeak). While reloading, try flinging your camera upwards a bit to throw the mag away and making sure you don’t pick it up again. New players can be a pain in the neck, we all know that. If they don’t understand english, your hope is lost. But if they know even a bit, you can use simple callouts like "kill brown" or "kill gray" to refer to suit colors they should shoot. Alternatively, if they know a bit more english you can use callouts like "don’t shoot until we shoot". Your instinct usually tells you to jump over a car, here, switching to "run" and holding "a"/"d" will allow you to swiftly dodge an oncoming car. Rarely, a fully charged crouch jump will save you as well. While throwing, throw with an underhand throw (from the bottom) instead from an overhead throw (from the top). Pressing page up and page down will raise and lower your mic volume respectively. In the corner you can see a "mic:<number>" value. 250 is the max. While in a car, hold ctrl for ~1s before exiting the car, as you keep holding ctrl, you will smoothly slide out without tumbling. Watch out, hitting a wall will instantly kill you though. If you’re under heavy fire and the enemy is far away from you, you can hold space, let go of it after a short while and then swiftly move your camera downwards/upwards to perform a frontflip/backflip. If you hold ctrl, your character will curl up, and if you’re lucky enough, land on his feet without falling over. 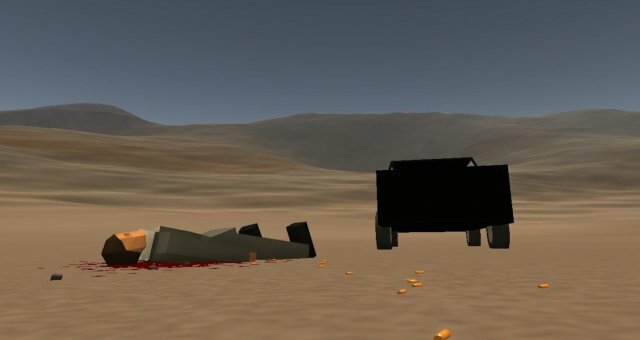 If you are stuck in a car and enemies are shooting at you, you can try shooting your own car to make it blow up and pop up, distracting the enemies or even killing them, but most importantly, throwing you a certain distance away from them, making it harder for them to kill you. Playing dead is an easy get out of jail for free card that works great on unexperienced players, simply, while laying down, unequip your guns and items and hold shift. Stay still until you are safe and then heal up and save yourself. If you hear a firefight, try listening in to the gunshots and identifying the gun. After that, you can count the number of casings left on the ground to count how many bullets the enemy has. You can also count the bullet holes. After a firefight, hold "h" to view the player list and then count the bodies, if the amount of bodies matches the amount of players on a team, you can be completely sure that you have wiped out everyone, and not just the bravest ones. Sometimes, you are matched against firepower that you cannot overcome by any means. Sometimes, you can talk yourself out of getting shot. If you cant move, remain still and start talking to the opponent, using funny catchphrases and smiley faces. Offer him goods, guns or cars for letting you go. Once he lets you go, heals you or whatnot, run instantly and don’t stop. While in your base, shoot out the glass from the small windows in the vault room and try diving through them, if you’re lucky enough, you can save roughly 2-3 seconds of walking time.